No, I haven't read it yet — it arrived in the mail yesterday — but Robert Scotto's long-awaited biography of the idiosyncratic music visionary Louis Hardin (1916-1999), better known as "Moondog," is now officially between covers. Subtitled The Viking of 6th Avenue, the book includes a 28-track CD. Publisher Process Media's site says the book's coming out in October, but Amazon.com, which lists the book with a November pub date, has it in stock. I had the distinct honor of seeing Hardin perform in 1989 at the New Music America Festival in NYC, at the Brooklyn Academy of Music (BAM). I'd read he was performing, and though I'd never heard him at that point, I'd seen the cover of the first Columbia LP and somehow knew this was something Not To Be Missed. So, my girlfriend & I bought tickets and flew from Chicago to NYC for the show (the fact that Negativland were also on the bill didn't hurt). Moondog was scheduled to play on November 16 in a concert with the BAM Orchestra. Tickets for the evening show were a bit expensive for meager boho bank account (especially since we'd flown in for it), so we instead opted for the free afternoon rehearsal; it turned out to be the right choice. Hardin had not only never performed with the BAM orchestra; he'd never previously performed live with *any* orchestra. In order to properly lead the orchestra, a system was devised where he conducted by pounding out the beat on one of his handmade drums (the Trimba, perhaps? Memory fails). Hardin invariably sped up as each number progressed, and some in the orchestra found it difficult to keep up; each time, Hardin berated them kindly but sternly. Not only was it a thrill to witness the creative process, our lucky audience got to see each piece played two, three, even four times instead of just once. Afterwards, we were treated to a lengthy Q&A session, where Hardin answered questions about his past, his music, his blindness, the creation of the various instruments as inspired by animal calls, the idea of playing tonal music as a contrary/rebellious act in an atonal world, his patronage by the likes of Philip Glass (Glass let the homeless Hardin sleep on his couch when Glass himself was a struggling composer eking out a living as a cab driver), his current life in a remote cabin in Germany, etc. At one point he was asked, "Why have you never performed with an orchestra?" The humble answer: "Because no one ever asked me before." As a finale, the organizers had tracked down Hardin's long-lost daughter, who the composer hadn't seen in decades, and they shared a tearful, emotional reunion onstage. All in all, quite a magical afternoon. I was there for the performance at BAM. Yep, it was a great experience! "who the composer hadn't seen in decades"
I checked, the book's only $16.47, comes with CD--I gotta get me one. 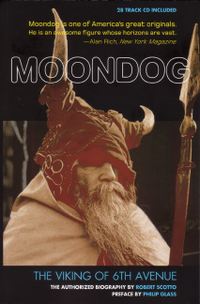 I have vague memories of seeing Moondog on the streets in midtown (I moved to NY in 1987). The frustrating thing is I don't know if the memories are genuine or just figments of my imagination, embarassingly enough. Webster Hubble Telescope -- OK, I'm blushing now.